At quick glance, artist Alex Losett’s Minimal Landscapes are merely pretty paintings. They are intimate snapshots of the Delaware Water Gap: a few square feet of rock wall, a mossy creek, a cluster of blooming trees. But there's more. These works are “after” pictures for Losett; they're based on photos taken after an invasive foreign parasite destroyed hemlock forests, after the government allowed power companies to install a series of steel poles nearly 200 feet high through a section of this once pristine national park. They depict places where drilling companies are now using water to fracture rocks in search of natural gas. The paintings were inspired by Losett’s many hiking trips in the Delaware Water Gap area over a span of 10 years. When she first visited, Alex was dazzled by the beauty of the park; this place where towering trees played games with lights and shadows on the ground below was unlike any other she’d seen while growing up in Russia or living in Canada. To Losett, nature was always an escape from society's relentless negotiation of meanings. In the artist’s view, nature allows us to explore personal meaning, and hers was in the connection she forged to it as a child as a safe place to wonder, marvel, and revel in her senses. But when the artist returned to the location some years later, she saw a different landscape: one more barren and less attractive. The rapid environmental changes wiped out her sense of security: no longer could she come to this place and find it reassuringly “eternal.” Moreover, she was confronted with a realization that her young son would never know this landscape as she had seen it. Although she hadn’t painted landscapes since art school, Losett decided to preserve in paint the current vistas. Losett’s Minimal Landscapes investigate moments of unmediated wonder: wading in a creek and being mesmerized by the interplay of light and reflection; soaking up the warmth of a rocky shore while being fascinated by the glow of the water; luxuriating in the touch of moss underfoot and marveling at the soft forest shadows; skipping across the boulders; exploring the wonders of a cracked rock wall; inhaling the fragrance of fresh autumn leaves; marveling at the gentle fuzz of spring trees. These encounters are captured close-up in a childhood “tunnel vision” and rendered with pronounced sensory appeal. Beneath the surface of this series is a call to arms: we’ve already lost so much, it says. “Don’t ignore what’s going on," Losett urges us. "Be aware. Be active. This project showed me that beauty is not a given. It can disappear at any time." 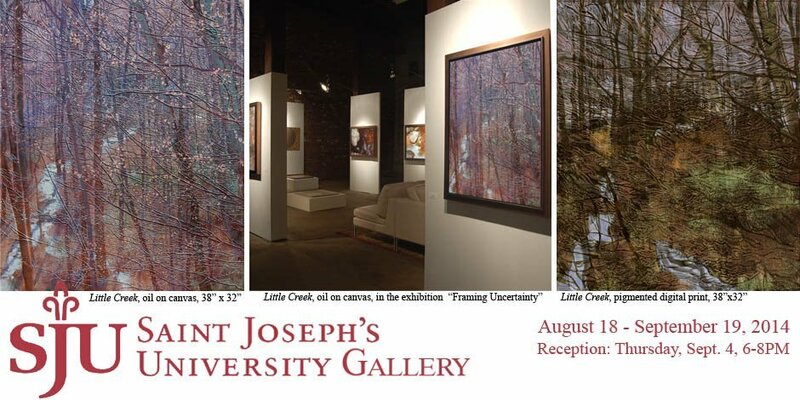 The exhibition “Rethinking Landscape” will be displayed from August 18 through September 19, 2014 at: Saint Joseph’s University Gallery, Merion Hall, Maguire Campus 335 N. Latches Lane, Merion Station, PA. Artist’s reception: Thursday, September 4 from 6 to 8 PM.